The perfect London pub was described in a 1946 piece by George Orwell for the Evening Standard. Orwell named one pub, The Moon Under the Water, as the quintessential boozer. There was one catch, it didn’t exist. Since pubs in the capital continue to close at an alarming rate, it is unlikely that any pub come close to Orwell’s ideal today. This is especially the case in The City, where Lloyds, one of the most historic financial institutions in the City, have banned their employees from consuming alcohol on weekdays between 9am and 5pm. The move has been described by one parched employee as “Orwellian”, although it is far more likely that he was referring to the nightmarish 1984 than the above article. Publicans will be no doubt be bracing themselves for the loss of business, whereas workers will be desperately seeking out their next stimulant. But it’s not just Lloyds who are rethinking alcohol’s relationship to office perks, workers are too. But if the lunchtime pint goes down the plughole, what other perks will employees seek instead? Some say the change is a positive and professional step into the 21st-century, other workers are spitting feathers. However, rather than playing Big Brother, it might be that Lloyds are just taking a sensible step. Alcohol is estimated to cause 3 to 5% of all absences from work; which equates about 8 to 14 million lost working days in the UK each year. This loss in productivity far outweighs the benefits of moral boosts for many businesses. Of course, persistent absences can reduce morale too, and certain employees tardiness can result in resentment from other employees. Of course, this is assuming that the average worker wants to drink alcohol anyway. Younger members of the workforce are less likely to appreciate a pint at lunchtime, or after work for that matter. A 2014 study found that millennials are less likely to drink alcohol than previous generations. The City, an environment that has been accused of sexist and outdated practices in the past, may not be likely to be at the cutting edge of employee morale and motivation—in truth, other offices ditched the lunchtime pint years ago. What are the perks these workplaces are offering. If not alcohol, what perks do modern workplaces offer? London office spaces are adapting to these changing needs. i2 Office, for example, who provide office space in London, offer caffeinated incentives rather than boozy perks, meaning employees can enjoy complimentary coffee and tea instead. Meanwhile, Shoreditch Platform, a coworking space in East London, go one step further and have a barista and juice bar on site. Offices in the future a much more likely to offer health-based perks and employee wellness programs. This is for two reasons, a) millennials are not only likely to drink less, they are far more health conscious and b) workplaces are waking up to the dangers of sedentary office lifestyles ever since Dr. James Levine coined the phrase ‘Sitting is the new smoking’. However, alcohol may still play a role for businesses in London in the future. f the way city offices are working is outdated, other modern coworking spaces are embracing alcohol. At a coworking space in Paddington, London, a new feature has been added: free prosecco on tap. The Brew Eagle House, a coworking space in Shoreditch, has an onsite cafe where members can enjoy craft beer after work, but also offers wellness programs. However, even that pales in significance to Cobrew, a brewery-based office space in Melbourne, Australia. Cobrew calls themselves “a local community hub that embraces diversity, forward thinking and collaboration” and, of course, beer. Perhaps the answer isn’t to ban alcohol from the office outright like Lloyds have, but to find a balance. Writing for ABC news, Alan Farnham writes that alcohol offers the chance for employees to bond and a little drinking can even stimulate the creative process. In London, it seems that newer types of office space have achieved the level of collaboration and openness previously only attained in the past by a few pints. 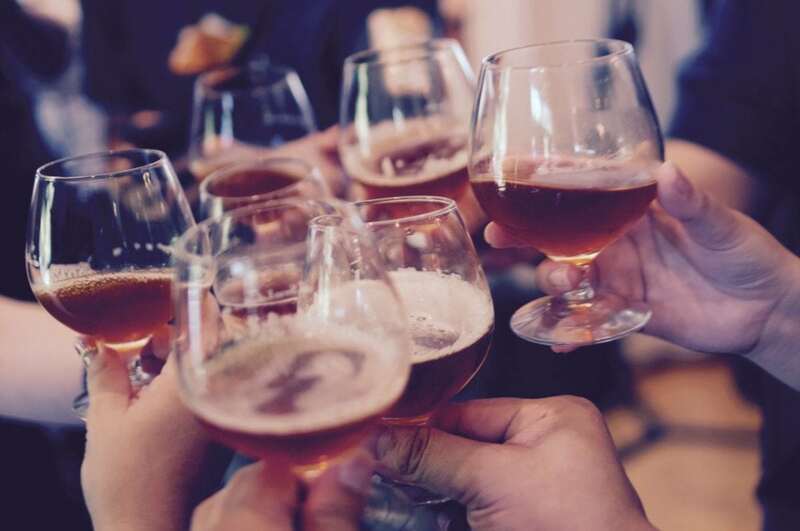 It seems that workers attitude towards drinking at work is changing, becoming more sensible and healthier, but that doesn’t mean alcohol can’t be used to boost workplace morale, but that it is used differently. Instead of lunchtime drinking sessions, we’re more likely to see beer tasting sessions and brewing workshops in the offices of the future. Bottoms up! Previous PostForget the ‘Hummus Crisis’, why not make your own?